Parecomic is a graphic novel about the system we live in—what’s wrong with it, and how we might be able change it for the better. The recent upsurge in popular protest around the world shows that people are not happy with the state of capitalism and desire an alternative that will work for the 99%, not just the 1%. Parecon is one such alternative, and Parecomic brings this to life in illustrated form. Parecomic is about Michael Albert—the visionary behind “participatory economics”—and his life’s struggle as a left-wing activist in the US, beginning with the heady days of 1960s student demos and lifestyle rebellions; following the developments of the antiwar, civil rights, woman’s, and Black Panthers movements; to the establishment of alternative media like South End Press and ZNet; and the development of the participatory economics model. "This graphic novel challenged me to think through new ideas as well as the world we live in. Even better it did so in a way I didn’t find boring or grating to read, much like some of the works referenced within it. Parecomic is a fine example of how far the comic medium has come. It’s no longer ruled by only heroes in tights, it’s now a tool in our greater understanding of the world and further education." 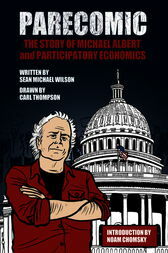 "As a primer on the history and theory of participatory economics, this title is never short on ideas, tracing the development of Michael Albert’s theories on self-management, social justice, and internationalism, and their origins in the civil disobedience and consciousness-raising movements of the late ’60s and early ’70s. As a student at MIT, Albert was inspired by the culture of activism to found Z magazine, ZNet, and the International Organization for a Participatory Society. Some readers may wonder why Wilson (AX: Alternative Manga) and Thompson (the webcomie Green Benches) have chosen Albert’s story for treatment as a visual narrative, and that treatment definitely makes some of book’s issues more palatable to a wider audience. Artist Thompson is also very adept at marrying the literal and the symbolic to allow Wilson’s prose, and therefore Albert’s ideas, to resonate with readers. There are moments, though, when the book stalls and readers find themselves wading through lengthy, text-heavy panel sequences featuring shots of Albert discussing a given issue. Still, Thompson and Wilson can be very inventive with their effects. Parecomic is inspired at times, and as a treatise on participatory economics, it’s pretty great. As a comic, though, it’s just pretty good." SEAN MICHAEL WILSON is a comic book writer from Scotland, currently based in Japan, who has written fourteen books of comics and manga. His work includes a version of Charles Dickens’s A Christmas Carol (with artist Mike Collins); Emily Brontë’s Wuthering Heights; Oscar Wilde’s A Canterville Ghost; The Japanese Drawing Room (with RING horror manga artist Sakura Mizuki); and the documentary book Iraq: Operation Corporate Takeover (with artist Lee O’Connor). CARL THOMPSON is a cartoonist based in Minneapolis. A graduate of the Minneapolis College of Art and Design, he has worked with writer Sean Michael Wilson on the political comic strip “Green Benches,” published monthly in the British magazine Blue and Green Tomorrow.